At Epsilon Health, we help our clients forge long-lasting relationships with their customers - patients and healthcare providers alike. Our expertise and powerful technology help clients create personalised messaging that drives informed healthcare decisions for improved patient outcomes. We will work alongside you to ensure that your needs are being met, and that your brand’s tone of voice is heard loud and clear by the people who matter, at a time when they’re most responsive to your message. 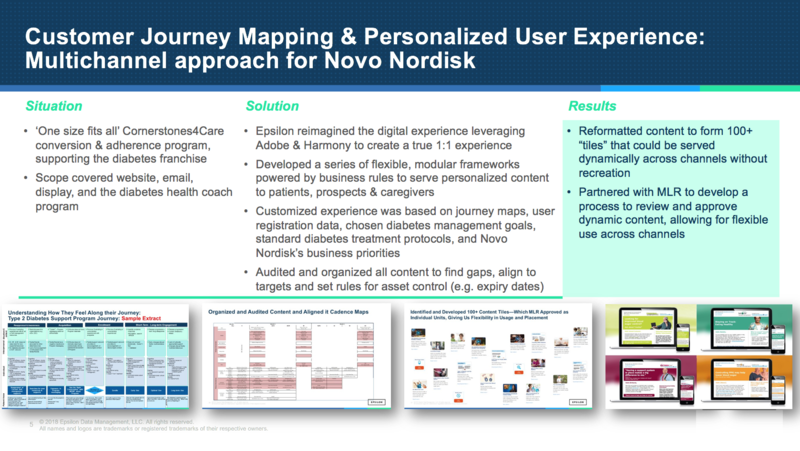 Find how we reimagined the digital experience for Novo Nordisk to create a true 1:1 experience below. Epsilon fuse Data, Strategy & Insights, Technology, and Creative to help you deliver truly targeted content to your audience. Developing a process to allow flexible content across channels.